In Face Up 21, the dealer always hits on soft 17. Interestingly, when the dealer is forced to stand (any Hard hand of 17 or more), the game takes over for you, and automatically hits for you until you win or bust. You can split any pair for a new bet equal to your ante, and can continue to hit on each hand, unless the cards split were aces, in which case each hand just gets one more card then you must stand. You can double down on Hard totals of 9, 10, and 11, and can double down after a split. Because you can see the dealer’s first two cards, insurance is not available, nor can you surrender in this game. Dealer wins all ties. Your Ante bet when playing Face Up 21 has to be at least 1, and can be no more than 250 USD/GBP/Euro. There are four different chips – 1, 5, 25, and 100 – that you can use to place your bet. Because this is a game of Face Up, where the Dealer’s hand is exposed, blackjack pays even money in this game, at 1:1. In fact, all winning hands pay at 1:1, so you can always know how much you will win when you place your bet! When you first load up Face Up 21, you will probably notice how clean the interface is. All the extra elements, like card shoes, chip trays, and the buttons you use to play, are clustered neatly around the edges of the table, leaving the center open and unobstructed for the cards to go. Once the game starts, things move quickly and smoothly, and even on older computers the game runs great. While there are some animations and card flourishes thrown in, they fly on by, never getting in the way of the game at all. Watch the dealer’s cards! 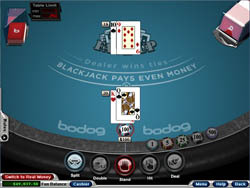 This might seem obvious, but it is easy to get into a habit when playing blackjack on a computer of just clicking away based on what your hand is, without glancing up to see what the dealer has got. This is especially important in Face Up 21, since you can see both of the dealer’s cards. If the dealer has a mid-high total, be careful! He might get to 21 before you do! Face Up 21 from RTG is an excellent game in itself, and as a Face Up blackjack game, it hovers high above the rest. The graphics achieve a high level of realism, and when you combine this with the smooth, quick gameplay and subtle sound effects, you get very close to a real live casino blackjack experience. How much can you win before going bust?